RelayRides is hosting a “Road Trip Essentials” campaign now that summer is officially starting. They are a peer-to-peer sharing car rental service I’d never heard of before, but love the idea. It’s similar to renting out your house, or renting someone else’s when you travel, but with cars. It’s something I’ll definitely look into in the future. Maybe even this summer since I have two road trips coming up. The question is — what are my absolute road trip essentials? As I thought about this, I realized that my few “must-haves” are a good reflection of how I like to travel overall. There are things we usually take with us: snacks, CDs, maybe an audiobook or game. But the things that I personally won’t travel without are different than what we pack as a family. Here’s a peek into my bag of 5 road trip essentials as well as a glimpse into my psyche. Surely you’re not surprised by this. After all, I named my blog ‘Browsing the Atlas.’ I really do love them and browse through them. We have a GPS and use it, but I still like to pull out the road atlas as we head down the highway and see what’s around; what cities we’re near and where we might go if we venture off the main drag. Having an atlas helps me put places in context and also gives me a chance to daydream and plan for future trips. Oh, how I love maps! This is always the first thing I pack, whether I’m going on a road trip or halfway around the world. I take a stack of books with me to release into the wild as I explore. (Read more about Bookcrossing here.) My family knows me well enough to know I never travel without Bookcrossing books, so sometime in the first day or two they usually ask me, “How many books did you bring?” It’s usually about 12. And those aren’t including the ones I bring along to read. I look at it this way: by ridding myself of those books during the trip, I’ve made room for souvenirs. Unless I’ve hunted for and found other Bookcrossing books on the way. It happens. And it’s usually the only souvenir I need. I always bring my travel journal with me. I write in it every night and try to capture the sights and sounds of our day. But I also bring a travel notebook journal in which I jot down ideas that come to me, places I want to visit or find out more about, and logistical details I’ll never remember about a place if I don’t write them down. I cannot travel without at least one travel journal. If by some odd chance I forget to pack it, it’s the first thing I have to buy once I arrive at my destination. I love travel guides and usually bring one with me on a trip even though I rarely use them. 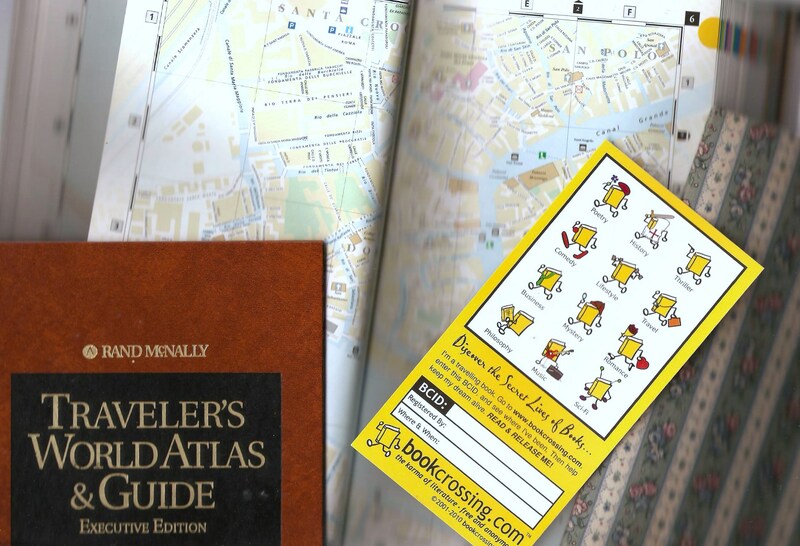 Before a trip, I’ve usually scanned a few travel guides and researched places to see online. Every once in a while, I will visit a place that’s recommended in a travel guide but what I mainly use them for is reference. I may not go to the cathedrals/museums/historic sites they mention, but it helps me put the places I do see into context. Surprisingly, I would rather listen to the radio as we travel than listen to the CDs and iPods we bring with us. Even when all we can get is static-y country stations, I like listening to songs I didn’t pick and hearing the local radio commercials and deejays. It gives me a sense of place and opens me up to music I wouldn’t normally choose. After all, I can listen to my CDs and playlists at home. What I realized as I gathered up my essentials is that they reflect the way I like to travel. I crave the unknown (radio) and want to be taken away from the familiar. I want a sense of where I’m going, but don’t want too much information (travel guides) to ruin the surprise. I like spontaneity and the chance to turn off the highway and discover the unknown (atlas). I like to put myself there and surprise others, too (Bookcrossing). And finally, I like to capture the experience in my journals and on this blog. The snacks, the GPS, and everything else we pack are creature comforts during long hours in the car, but the items essential to me are the ones that make each trip unique. What are your road trip essentials? Really good choices, Juliann! 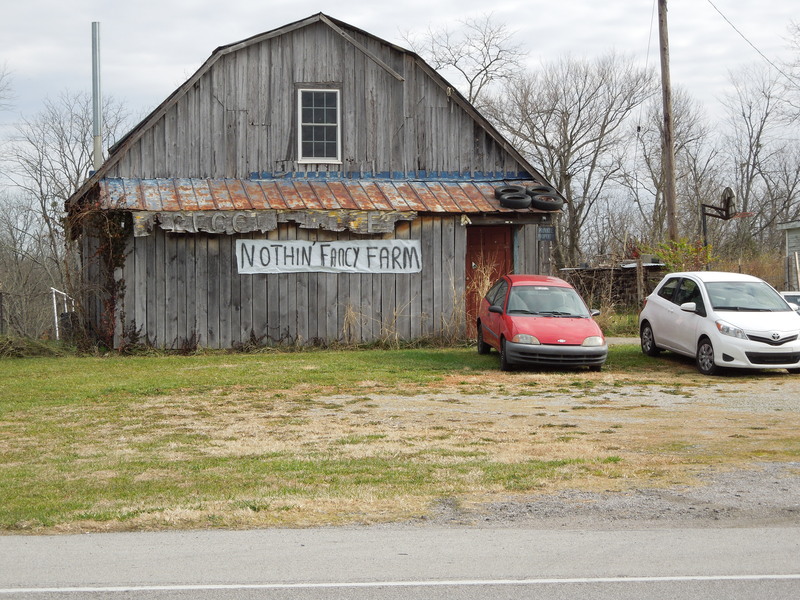 I just love that photo of the Nothing Fancy Farm! I do, too. We drove past and had to turn back. That happens to us a lot. That’s why I like to drive! I don’t even have to ask; I just turn the car around and grab the camera! I’m in love with this great idea of bookcrossing! I’d never heard of it, but it’s really great – I have loads of books I shipped here in the container, itwould be fun to leave them around egypt in strategic spots! I’m looking for my sticker paper tomorrow, I’m hooked! I got a kick out of you loving the atlas, but I must admit it was a no brainer, lol with your blog name, and I admire your ability to listen to country music while on road trips… I’m an npr nut and thankfully they are everywhere in the states. Now I listen to it online! I hope you do start releasing your books. It’s so exciting when you get a catch and someone goes online and journals that they found it. Sometimes it takes years– which just adds to the fun. Oh, great idea, I have glue and paper, too, I’ll have to do that, I’m psyched! I love the book crossing idea but aren’t you worried that you might get picked up by the police as a bit of a nut, or a litterer? It’s rare I drive any distance but Van Morrison and Leonard Cohen on repeat would do me fine. This question has actually come up in the forums. Only in the US, I think. There are certain places we know not to leave them — like in airports. And sometimes people seem suspicious of a book with a label on the front that says “FREE.” (Sad state of affairs.) But more often, if someone sees you leave a book, they try to catch you to give it back. As for music, I start with classic rock, but eventually somewhere in Kentucky or Tennessee, all we can tune in is country. I like the idea of picking up only bluegrass in Kentucky and zydeco in Louisiana 🙂 Surely the stereotype doesn’t exist to that degree? Not to that degree, but when you get up into the Appalachian mountains in Kentucky and Tennessee, the only stations with a strong enough signal seem to be country, though you might get a gospel station, too. I’ll have to think about this for our next trip, though. Wonder if I can convince the kids to let anything go?? Haha. That is so reflective of Singapore. Though I did leave a few books there and one was journaled. I was thrilled. Oh! That’s never happened to me. We’ll definitely have to try it again. I didn’t think much about this until you mentioned it but for me, even though I’m definitely someone who researches things to do and places to see online beforehand, I rarely (if ever) bring physical travel guides with me and just rely on my brain to remember them. If I forget something, then it clearly wasn’t meant to be. Or maybe I’m just trying to be overly romantic about it. The bookcrossing sounds like so much fun! Though I’m not sure the rest of my family would understand, given how we hoard our books at home…..
We do, too. We have 10 bookcases in our house and stacks of books on the ground. The funny thing is, since I started Bookcrossing, I seem to have even more books, though I try to clear them out all the time. For every one that leaves my house, two more seem to come in. You must be a long lost sister. That’s everything I pack too. Spooky. Bookcrossing sounds like fun and a movement we can definitely get into! And as for my travel essentials. My camera/s, a fishing rod, maps, a leatherman and a deck of cards. That was great list and perfect summation of the way you travel, and no I am not surprised at all 🙂 In fact my list would be near identical, with the addition of blown up printouts of Google – My Places, with my preferences marked with specific icons. Cannot do without them for any kind of trip. Bookcrossing is new to me too, and I think it is a brilliant idea. Shall have to see if there is anything of the kind locally. What an interesting peek into how you travel. I carry lots of printouts, mostly hotel confirmations. I dream of coming across a book crossing book one day (I really should participate in it too…). I love that you write in a travel journal every night when you travel too; that’s so great. I do some sketching and recently decided to bring my sketch book on my next vacation. That’s a great idea. I can’t draw, but I’ll suggest this to my daughter. I find more and more that I’m writing it down just so I can relive it years later. And am thankful that I do. love to read this! Probably going on a little roadtrip this summer so much needed information ;)! Great post! I love the part about listening to the radio to get a sense of the place!